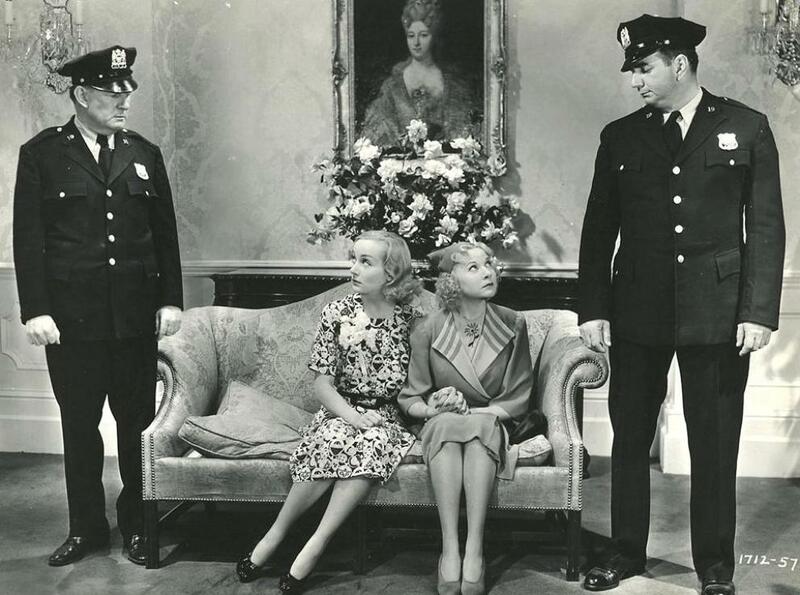 Classic Movie Man: Carole Lombard and Una Merkel in "True Confession": Inspiration for "I Love Lucy?" Carole Lombard and Una Merkel in "True Confession": Inspiration for "I Love Lucy?" I Love Lucy was a landmark in television history. The original series ran for six years on CBS and for four of those years was the top-rated TV show in the country. 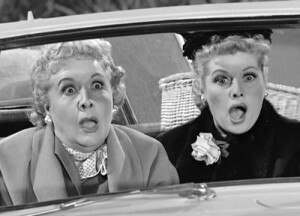 One of the dynamics that made the show work so well was the relationship between Lucy Ricardo (Lucille Ball) and her neighbor and best friend Ethel Mertz (Vivian Vance). Lucy was always getting into trouble and Ethel, trying to help her friend, always seemed to get caught up in Lucy’s crazy schemes. 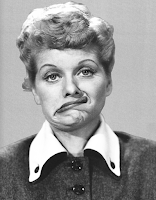 These schemes usually centered on Lucy’s attempts to break into show business and trying to establish a career of her own, much to the dismay of her husband Ricky. Similar sitcom scenarios are played out today, but it was all new during TV’s Golden Age. Did you ever wonder where Ball got her major inspiration? It’s no secret that Ball adored Carole Lombard. Lombard was sort of a mentor to Ball when both were working at the RKO studio. Lombard was one of the few truly beautiful movie stars who wasn’t afraid to be silly on screen. She also wasn’t concerned about making faces, which took away from her glamour. Lombard was adored by the public and was glamorous enough to snag the “King” of Hollywood, Clark Gable. 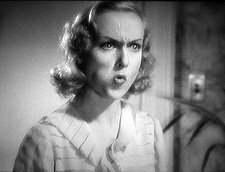 During the mid-to-late 1930s, Lombard was America’s “screwball girl.” She made her mark with classic comedies like Hands Across the Table (1935), My Man Godfrey (1936), and Nothing Sacred (1937). One comedy that was a huge hit in 1937, but isn’t well remember today is True Confession. 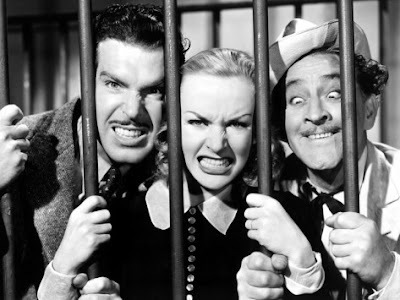 The film, directed by Welsley Ruggles also stars Fred MacMurray, Una Merkel, and John Barrymore. Lombard plays Helen Bartlett a housewife and aspiring fiction writer. Helen is a habitual storyteller; she is often fast and loose with the truth—just like Lucy. Helen bangs out short stories on her portable typewriter at home while her husband Ken (MacMurray) tries to establish his fledgling law practice. He has a problem: he’s only interested in taking on clients that are truthful and innocent. He is the complete opposite of Helen. Ken’s refusal to take on “guilty” clients causes friction between the young couple struggling to make ends meet. Helen writes stories in an attempt to help with the family finances, which Ken resents.When Helen is conjuring up a lie, her tongue is planted firmly in her cheek and you can see the wheels turning in her head—shades of Lucy. Helen’s best friend, Daisy McClure (Merkel) knows Helen is a liar, but she still manages to get tangled up in whatever crazy caper Helen finds herself in the midst of. When Lombard and Merkel’s characters interact with each other, it’s hard not to think of Lucy and Ethel. The dynamic is amazingly similar and their on-screen chemistry is genuinely appealing—just like Ball’s and Vance’s. And just like Ball and Vance, both women are attractive, but Lombard is the more glamorous of the two with Merkel never outshining her costar. When Helen applies for a private secretary position at an incredibly generous salary, the wiser Daisy, smells a rat. Helen’s boss Otto Krayler (John T. Murray) really doesn’t want a secretary, but rather a playmate. On her very fist day on the job, Krayler makes a pass at Helen and she quits in a huff. Later she realizes that she left her hat and coat at Krayler’s lavish apartment. When she and Daisy go to retrieve them, the two discover that Krayler has been murdered and that according to detective Darsey (Edgar Kennedy) Helen is the prime suspect. As goofy as Helen’s character is, she has some genuine qualities. She truly loves her husband, even if her lying ways often work against their relationship. As a way to get her husband some favorable publicity as a lawyer and to avoid telling him that she took a job behind his back, Helen confesses to killing Krayler in self-defense, which isn’t true. Helen believes that if her husband successfully defends her, his career will be set—sounds like a plan Lucy might dream up. Helen has lied so many times to Ken that at this point it’s harder for her to tell the truth. In jail, Lombard is dressed in a simple black outfit. 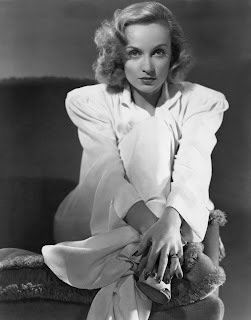 With the blouse’s large white collar and her hair combed back, she looks like Greta Garbo in Queen Christina. Lombard did a beautifully funny imitation of a Garbo-like character a year earlier in The Princess Comes Across. Daisy, always the loyal friend—Ethel all the way—goes to Helen’s trial that is also attended by an odd man named Charley Jasper (Barrymore) who thinks Helen is innocent, but keeps this to himself. He is generally obnoxious, resorting to blowing up balloons then letting the air out slowly, disrupting the court proceedings. Ken manages to successfully defend Helen—with some hysterical courtroom acting—and she is a free woman. With all the publicity generated at the trial, Helen is now a celebrity on the lecture circuit and has a best-selling autobiography (My Life, My Struggle). Daisy now works with Helen as private secretary and story collaborator. Ken has a thriving law career and the two seem to have everything, but the truth stands in the way of their happiness. Because of Helen’s habitual lying—with the ultimate lie pretending to be a murderer—their marriage isn’t what it should be. Ball wasn't afraid to look silly. Just when you think things couldn’t get any more complicated, Charley Jasper shows up with Krayler’s wallet and blackmail on his mind. Ken comes to the rescue, but the “truth” about Helen is revealed and Ken has had enough. At their new lake house, where Ken and Helen now have a maid, (Hattie McDaniel), Helen and Daisy walk along the lake in the late afternoon. Helen reflects on the mess she’s made of her life, even though she has the money and success she’s always craved. Afraid she’s going to lose her husband, Helen comes up with one more lie that seems to keep the marriage together. The movie ends with Ken throwing Helen over his shoulder and you’re left wondering what new caper (lie) she’ll dream up next—just like Lucy! 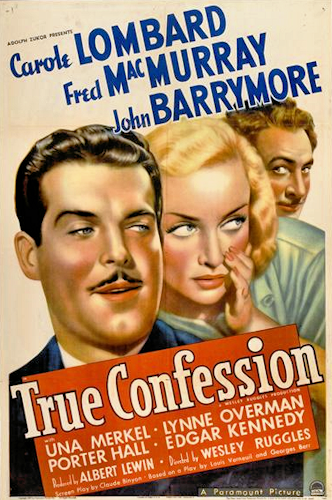 True Confession was popular with the critics of the day and a huge box office hit. It was the fourth and final collaboration between Lombard and MacMurray who had earlier starred together in Hands Across The Table (1935), The Princess Comes Across, (1936) and Swing High, Swing Low, Paramount’s top grossing film of 1937. Nothing Sacred, released the same year as True Confession, and considered a classic today wasn’t nearly as commercially successful. Both films were released on Thanksgiving Day, 1937. Backstory: Lombard was responsible for casting John Barrymore in the supporting role of Charley Jasper. At this point in his career, producers were reluctant to hire him due to his alcoholism and his refusal to memorize his lines (he read them from cue cards). But Lombard never forgot her big break in Twentieth Century, a film in which Barrymore was the top-billed star. She learned a lot from Barrymore during that production and she was forever grateful. She even gave him star billing alongside herself and MacMurray. Lombard was a true and faithful friend.